The last time I wrote about the guys at Dim and Den Sum, Cleveland's newest wave of mobile food trucks, they were just getting started and still trying to establish their menu, weekly locations where they would be serving up their food, and building a loyal following of customers. Part of the trouble that I initially had was that they were either on the opposite side of town during lunchtime or only serving food to the post-bar crowd late at night in Tremont. Neither were good for my schedule. Fortunately, after Case Western Reserve University (incidentally, my alma mater) turned them down their request to set up on campus, the much more cool cats at the Cleveland Institute of Art saw the unique experience that these guys were trying to provide to the culinary scene in Cleveland and graciously allowed them the use of the parking lot at the Cleveland Cinemateque from 11:30 AM until 2:00 PM every Tuesday (and as it turned out, sometimes other random days as well). And since my daytime job has me a mere five minute drive from this location, I have taken it upon myself to check them out several more times since my first review. The Cleveland Cinemateque was located at 11141 East Boulevard, Cleveland, OH 44106. While there is a number listed for the Cinemateque, it really has nothing to do directly with the Dim and Den Sum guys, so there isn't much point listing it here. That being said, you can always go to their website here or contact them via their Facebook page here or their Twitter account here to learn about the daily menus or where they will be serving up their delicious eats. The one lesson I learned early on was that while they usually have one or two classic items from their introductory menu, many days the chefs presented what was fresh, local, and in-season. Showing up for some grub meant that I had to roll with the punches as not every item was offered every time. At the same time, this meant I got to try a variety of their off-the-cuff culinary techniques and flavors, which I greatly appreciated. Just like my first visit, the tots were fried perfectly. 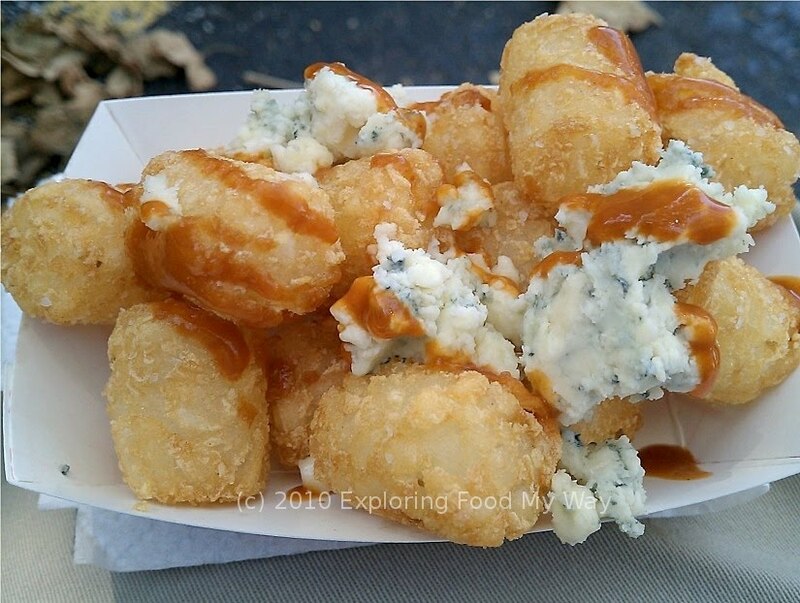 While I thought the blue cheese was quite an assertive flavor for the tots, as always these were crispy and delicious, from first bite to last. 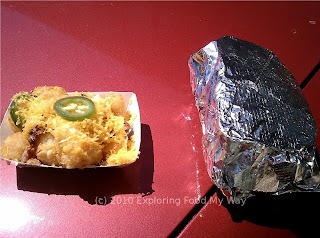 I think some flavors work better than others with the tots and while this wasn't the best pairing, neither was it the worst. Adorned with smoky pepperjack cheese, lettuce, tomato, and a spicy sauce which was vaguely reminiscent of the sriracha mayonnaise that came on the PBLT, this local beef burger had been cooked perfectly to medium. 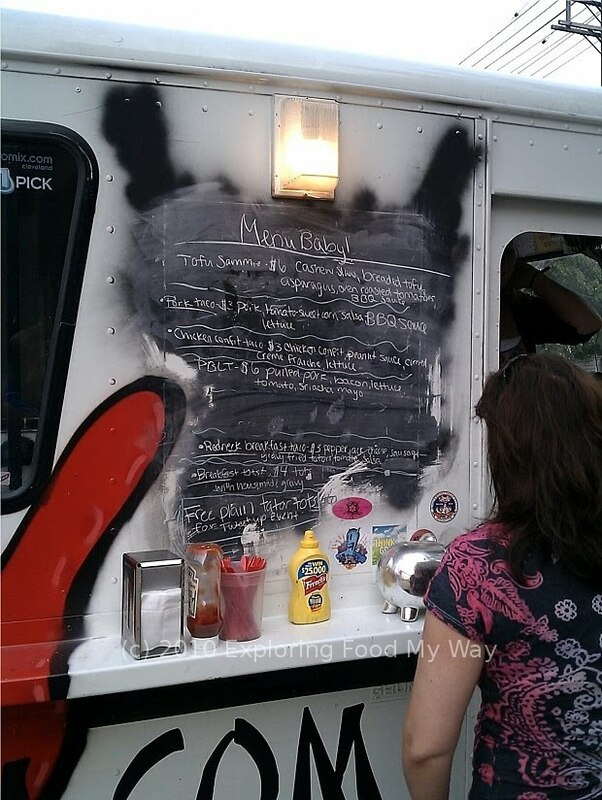 I know that many of the dishes that the guys serve at the truck are cook-ahead-and-reheat types of foods (like beef shank and hot dogs). It was nice to see them tackling made-to-order food and doing a good job of it as well. The burger itself was a much better success than the tots were today. The flavors definitely blended together and I had to employ a hunched over stance in order to avoid dripping anything on my work clothes. 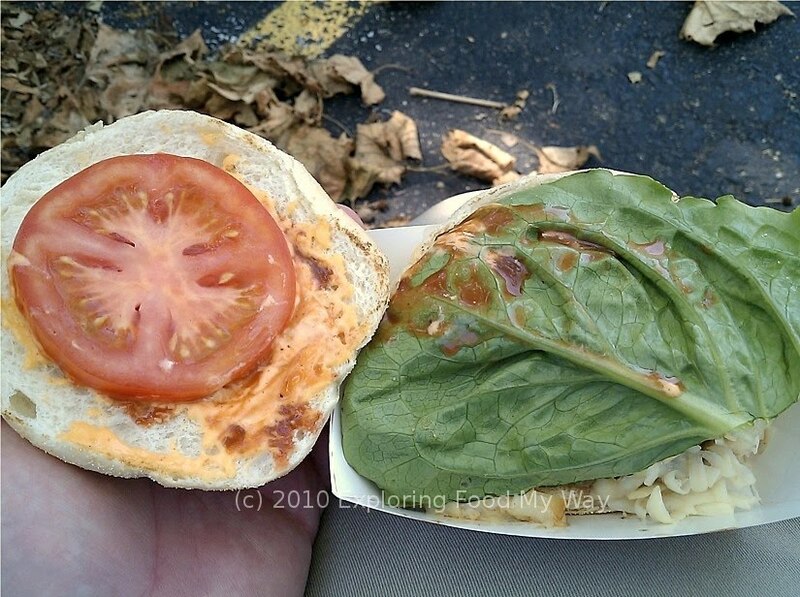 For an extra $2 I could've added some pulled pork on this sandwich, but I figured that might be gilding the lily just a bit too much. I think the burger was quite good the way it was. What struck me about my visit this time was that they had put out a call on their Facebook and Twitter accounts requesting what people would like to see on the tots. 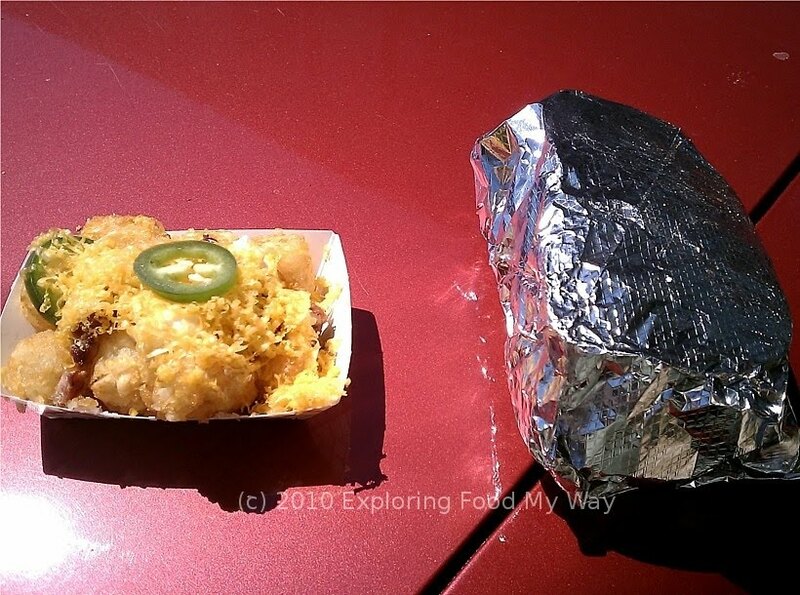 Apparently Sarah won today with the Jalapeno Popper tots. Being a sucker for that now ubiquitous (and usually poorly prepared) bar food, I couldn't help but order the tots. When considering my options for a sandwich, I definitely wanted to try something unique and new, and Phil's Meatloaf Melt seemed to fit that bill quite well. After paying for my meal, I walked over and waited for my food while watching the chef prepare it inside. The one odd thing I noticed that felt out of place was an opened bottle of Sweet Baby Ray's Barbecue sauce sitting on the prep counter. I didn't give it a whole lot of thought (other than the fact that it was odd to see it someplace where they pride themselves on making so much of the food from scratch), until I received my food and took it over to a spot where I could photograph it. Comprised of tots, sour cream, bacon bits, cheddar cheese, and topped with fresh Jalapeno slices, these were pretty darn tasty. 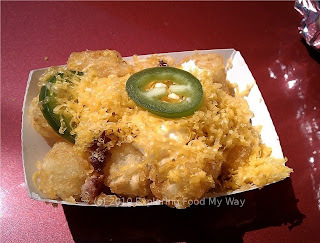 I liked this incarnation of the tots than the ones I had eaten on my previous visit as the tots didn't get lost in the layers of flavor. The Jalapenos, while adding some heat, didn't overpower the rest of the dish. In my mind, these were a definite hit. Sarah definitely knew a good thing when she suggested it. 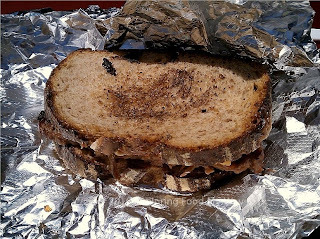 As you can see, the sandwich reveals the Dim and Den Sum guys' love of pulled pork. 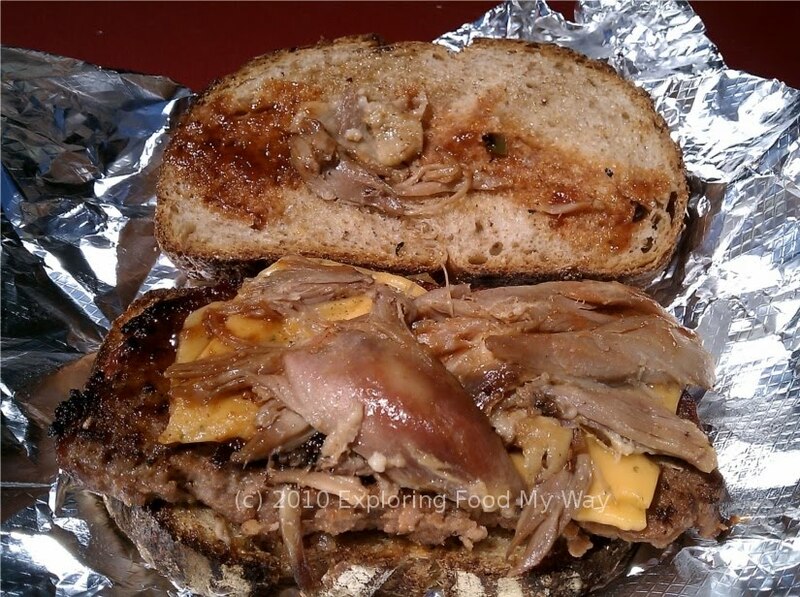 Here you had a slice of meatloaf which had been warmed back up, pulled pork, grilled onions, a slice of Cheddar cheese, and barbecue sauce. When I saw the barbecue sauce, I put two and two together and realized that had been the purpose of the commercial sauce sitting on the prep counter at the truck. Regardless, I replaced the top slice and gave it a bite. The first item that stood out to me was the bread. A hearty rye bread, it definitely kept its integrity, even after I had taken several bites. 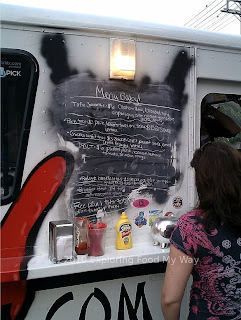 The meatloaf was a touch spongy, which was a texture I didn't care all that much about, but the flavors were quite good. The richness from the pulled pork added another layer of savoriness and the slight tang from the barbecue sauce helped somewhat to cut through the fattiness of the rest of the ingredients. Personally, if they were going to use a commercial sauce, I wish that they had gone for a more vinegary, less sweet version like Stubb's Original BBQ Sauce. I think it would've added a better overall balance of acidity. For my third and final trip to the truck, I ventured a bit farther from the Cleveland Cinemateque location to a corner in Tremont where The Treehouse was located. Apparently, a Tweet-Up was going on inside The Treehouse and the Dim and Den Sums guys decided that it would be a good location for a Thursday night visit, offering free plain tots to anyone attending. Having gotten off work rather late, I decided to head there and grab a bite for dinner before returning home to Akron. Having never had this served in a can before, I definitely have to comment that it had an interesting taste. 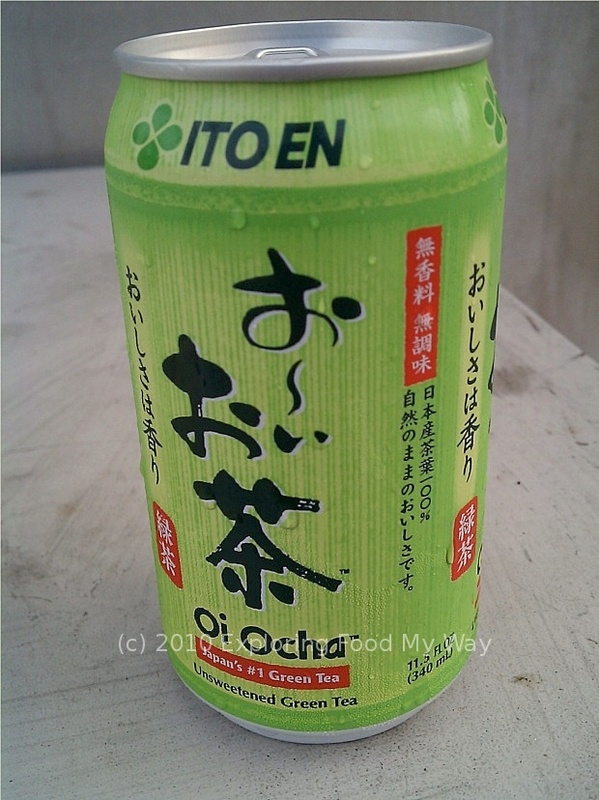 While the English on the can didn't say anything about the green tea being smoked, once I tasted the cold liquid inside, I was almost sure that this was what I was drinking. Comprised of pepperjack cheese, homemade sausage gravy, smashed tots, lettuce, and a tomato salsa, this was quirky and delicious. It was certainly an odd combination of items, but they really worked well together. Actually, the thought of sausage gravy, tots, and cheese seemed to have come straight from a casserole recipe from the likes of Paula Dean, but the tomato salsa added a brightness to what would otherwise have been a pretty heavy flavor. 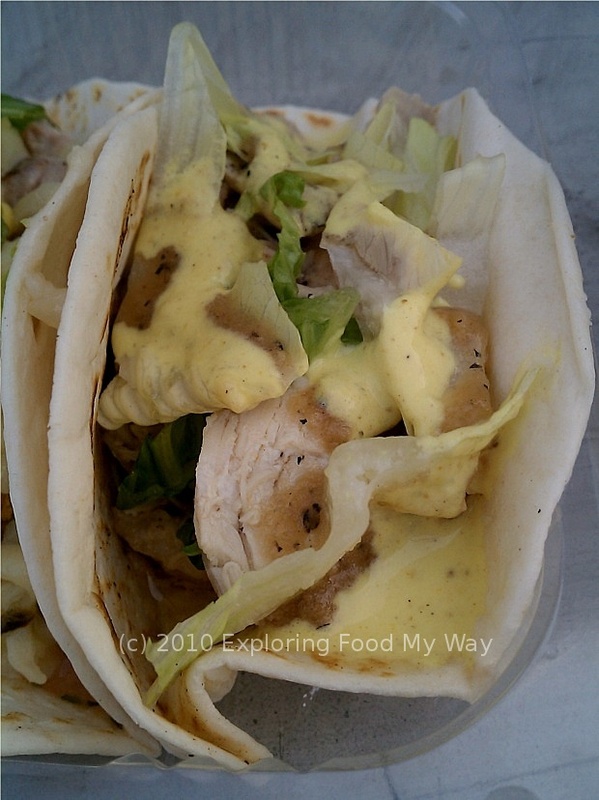 Besides the chicken confit, this taco contained lettuce, a peanut sauce and a green curried creme fraiche. The chicken was moist and delicious and the combination of the peanut and green curry flavors definitely evoked the distant lands of Thailand. The curry in the creme fraiche wasn't overpowering and just subtly wove its way through the other flavors in the taco. 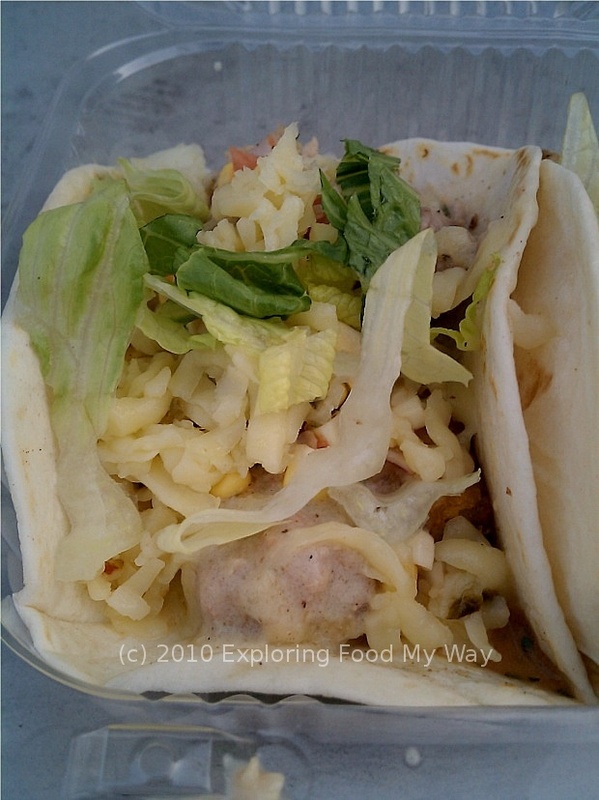 Of the two, I think I enjoyed this one more than the Redneck Breakfast Taco, but in all honesty, I rather enjoyed them both. I continue to remain impressed with the level of creativity and execution of the food coming out of this mobile kitchen. Clearly they have started to build a cadre of loyal customers as the truck has always had people at it whenever I go. In fact, the guys who run Dim and Dem Sum, Jeremy Esterly and Chris Hodges, are already in the works of adding at least one, if not two, new trucks to help cover Cleveland even better. 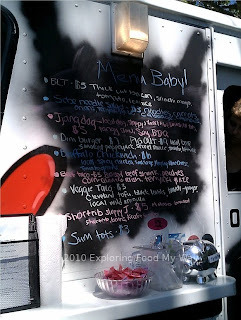 While the new truck won't be exactly the same menu as the current one, they will still provide unique and tasty mobile food experiences to what I perceive to be an eager Cleveland crowd. Take the time to track them down. You won't be disappointed. I found them in Coventry 2 Fridays ago. Facebook said they were going to be there at 9:00 and they didn't show up until 10:30! My friend and I had to go get drinks to waste time waiting for them. 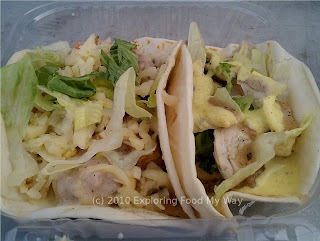 We split the curry chicken and waffles, PBLT sandwich, Ratatouille tacos and potato salad. The chicken and waffle and PBLT were awesome. The Ratatouille tacos were gross with slimy tomatoes or something in them. I took a bite of potato salad and realized it was chicken salad. I went to the truck to tell them they mixed it up and the guy goes sorry and goes to throw it away. I'm like, I'll eat the chicken salad too since I already took a bite. But he insisted on throwing the container away and gave me the correct potato salad. Kind of bizzare! Overall I did enjoy the experience though. I read somewhere that they may be coming to Akron as well. I hope so, would love to give them a try. 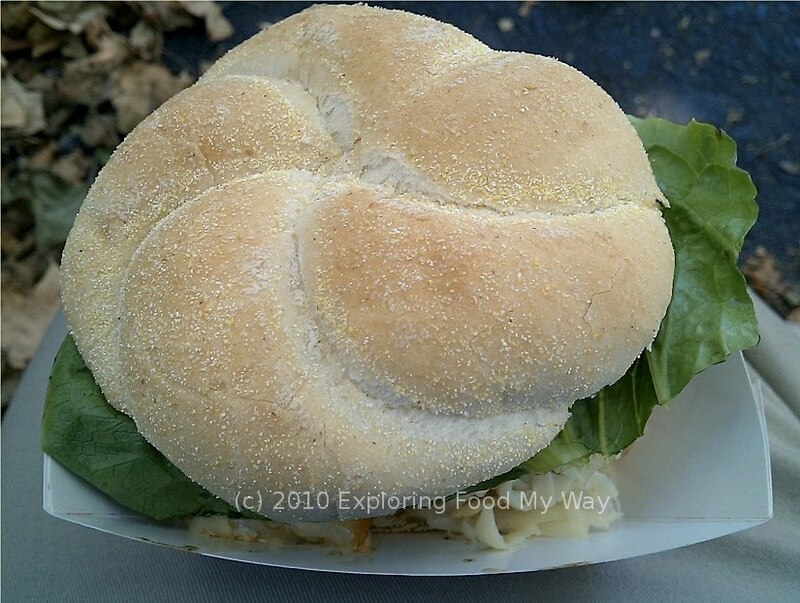 @John K: They do already come down to Akron from time to time, but it's usually for special events, like the National Hamburger Festival. As a resident of Akron, I, too, am hopeful that with more trucks, Akronites will have a better chance at tracking them down. If you have an iPhone, you can get their iOS app from Apple's App Store. It is a free download. 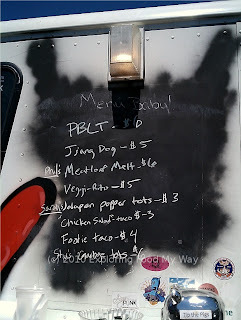 We built it to show you where they are (based on when Chris and his crew update the backend), what's on the menu and what's left. It also shows you how to get there and where they will be next. If you try it and have any feedback, let us know. @Dan: Thanks for posting about the iPhone app for Dim and Den Sum. Sadly ... well, okay, not-so-sadly, I own an Android powered phone and thus won't be able to test out what I'm sure is a great application. Until an app for Android is released, I guess I'll just have to follow their Twitter feed. For those readers out there with iPhones/iPads, have you tried the new app yet? What do you think? Have YOU Heard Of Edgar's Restaurant? Fame! Glory! A Free Set Of Emerilware!